In the old days I used to export designs to png, upload to my web server, and send links to clients via email. This works fine on tiny projects, but if you're designing and iterating an app with 10+ pages, it quickly becomes overwhelming. Trying to keep track of the designs and different iterations via email becomes impossible. I've mulled this over for awhile and came up with what we believe is a good solution. We love using RedPen for ultra quick, contextual feedback. 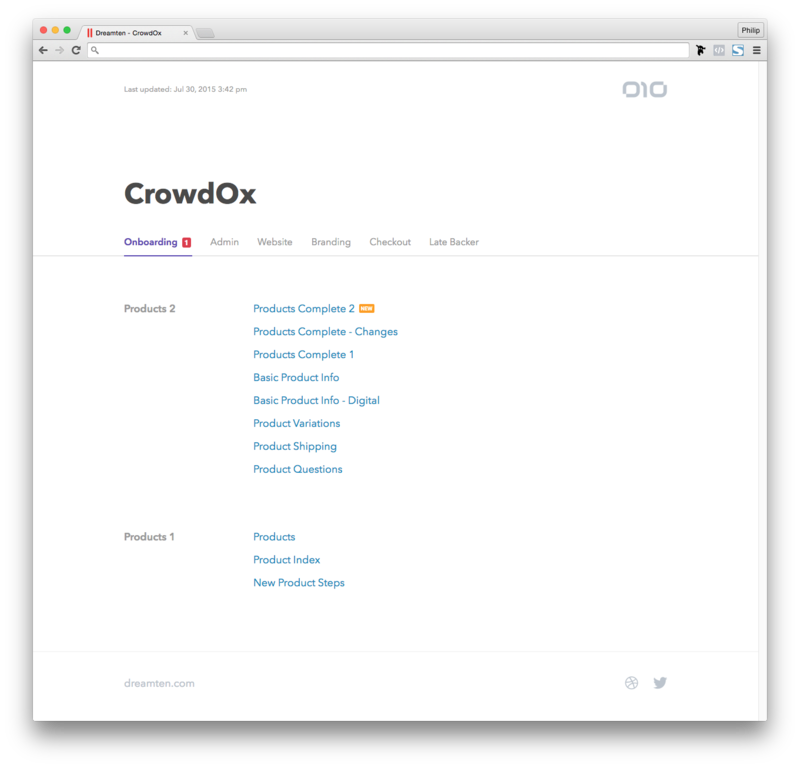 Multiple people can give feedback directly on a design with zero training required. We tried alternatives such as InvisionApp, but found it confusing for clients and cumbersome to manage. What we didn’t like about RedPen is how it organizes projects, and how they upsell you if you’d like more than 5. We decided instead to design our own responsive storyboard html/css template. 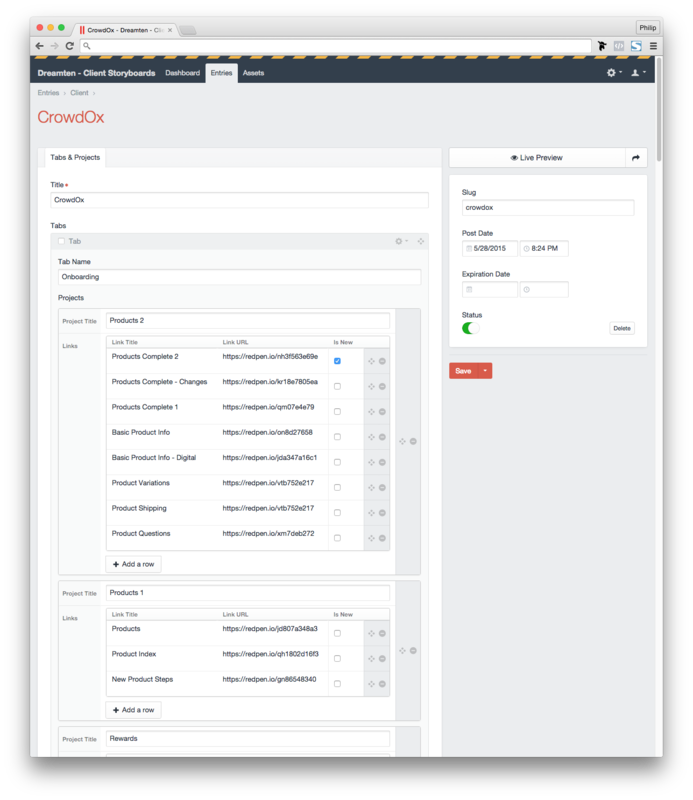 After the design and HTML/CSS, we integrated the template into Craft CMS. 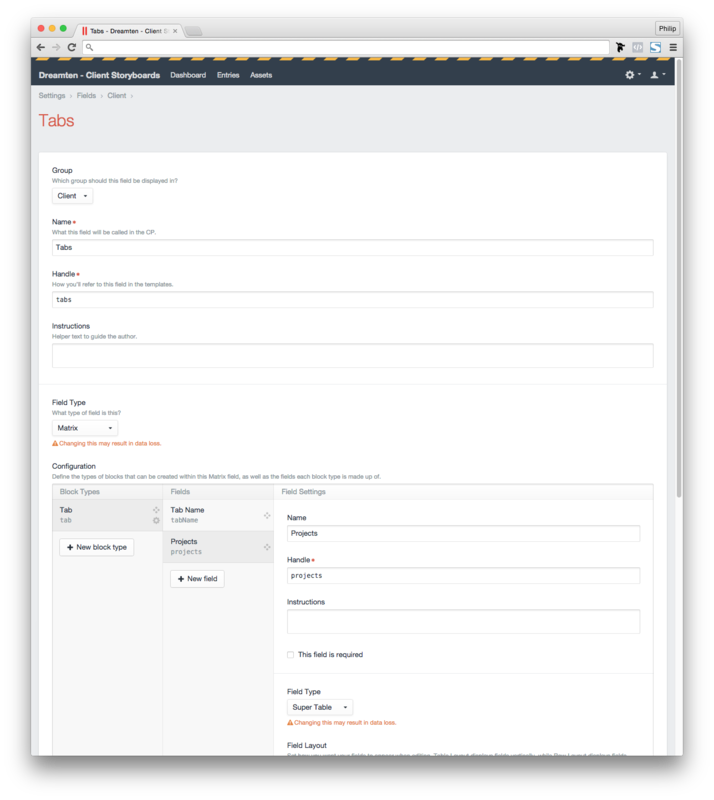 We created an entry type named Client, then created field types using a combo of the Matrix and Super Table Plugin. We now have a simple to use entry form that allows us to quickly build out complex storyboards. Using the various field types, we can easily create tabs and organize content within each tab into sections, and within each section we have links (these are URLs pasted from RedPen). We have a column to denote a link as “new”, which gives it a small new badge next to it to draw attention. What do you all use to present and keep track of work? Would love to hear how all of you smart people handle this. Thanks, I've just signed up and plan to give it a go. Invision all the way for me. All my clients are on it, I have not had issues with them learning/ knowing how to use it. Versioning works fine for me. I have simple marketing site projects on there. I have very complex apps with dozens and dozens of screens on there. Trello - a card for each screen. User stories on the card. Sketch - we have one master file for the project, that’s it. Invision Live Sync - runs in the background and automatically syncs the screens (artboards) to the Invision project online. Does all the versioning. If I want an older version of the file from a few days ago, I can go online and download it. This way there is not confusion about “what is the latest file”. Invision also automatically handles asset extraction if you put the right extension in - .png, etc..
Invision - customers can see things (I can choose not to sync some artboards with a minus - sign) as they happen. They leave notes. I can give them a “tour” on the artboards that leaves notes, which explain the design decision. Comments for developers can be left as well. No more tedious documentation for a lot of situations. It’s all on screen, collated and ready. Slack - If you’re using email for project management, you’re failing, imo. I create a Slack team for each customer. All communications are centralized in there. Often when I’m working, like now - I will leave the team room for that particular customer open. We can have real-time discussions about the design, as Invision automatically syncs they can see the result right then and there. Finally, we have a centralized stream of communications that keeps everyone accountable. Regardless of all these tools. The key is to have a system and work flow that best uses them. We use Slack internally, haven't thought about using it for clients though. Interesting about Invision, maybe I need to give it another shot. Thanks for your insight!